Live In Armenia is a 2CD/DVD digi-package (also available as an audio 2LP gatefold sleeve version) to be be released through Frontiers Records and available from 23 September 2011. 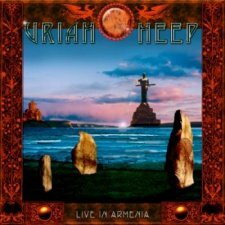 Live In Armenia was recorded during Uriah Heep‘s 40th Anniversary Celebration World Tour from last year. “It was unique because it was a first for us, and the fact that our music meant so much to so many people, was just wonderful” says Mick Box. “It cannot get any better than that. There were some technical problems to overcome, as we played on hired equipment, but the emotion of the night won through, and if asked, we would indeed go back and play again”. The DVD includes all of the above tracks. This entry was posted in New Album. Bookmark the permalink.